Outside of the Cloud and Big Data there is a word that is over utilised and often miss-purposed in modern employment (plus unemployment or underemployment) parlance. 1. To throw into confusion or disorder. 2. To interrupt or impede the progress, movement, or procedure of. Having a look at some of the mainstream HR discussions taking place at the moment you would think that the disruption taking place in our modern workplaces only offers opportunities and that the liabilities of disruption and disruptive technologies can only ‘revolutionise’ tired industries. What does disruption look like (macro-view)? According to the Australian Parliamentary Library the amount of small businesses in Australia that employed 1-4 persons decreased from 528,669 to 497,191 between 2007 and 2011 (impacting between 31,528 to 126,112 persons or 0.2 – 1.2% of the participatory population during that time). During the same period small businesses which employed between 5-19 persons increased from 227,883 to 233,832 an increase equal in-line with economic growth. 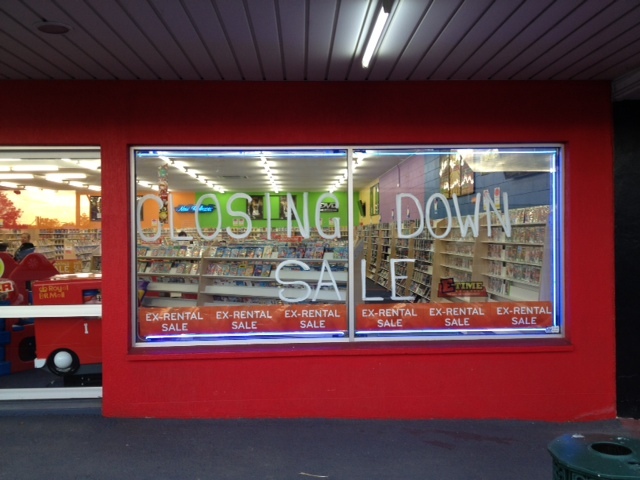 That photo, taken only this week was one of two DVD micro-businesses left in Gympie, a small regional city of around 20,000 souls some two-hours north of Brisbane Queensland. It’s been operating for around 20-years, is a family run business and employed around half-a-dozen first time workers in a part-time capacity. There would have been an extensive list of maintenance and supply-chain inputs which allowed this business to run and assisted other small enterprises who provided those services. Next month there will be one less family run micro-business in this small regional town which can ill afford the loss of any business. That family will now be looking for other employment as will the part-time workers and all the inputs required to run will now be less one client. What will replace this business? ‘Peak Jobs’ is the idea that technology is replacing jobs faster than it’s creating them. For those more technically inclined it can also be attributed to the finalisation of the increased growth in average output (and income) per labour unit due to technological change since the 1820’s as put forward by Robert Solow (1956) or the commencement of technological unemployment as put forward by John Maynard Keynes (in the 1930’s) without the opportunity to transition into new roles as productivity increases but global employment declines. For Australia this meant that not only was there a movement by larger businesses toward part-time or flexible work options but also a Darwinian attrition of small businesses. This was especially impactful on micro-businesses which employed 1-4 persons since the GFC and now is impacting on the next tier in the SME chain. All of this without a likelihood of same-for-same employment transition across the economy as disruptive (read technological) replacements are sourced, placed and deployed. Publishing, music, retail and travel are just the tip of the spear. Wait until disruption really starts to squeeze. Peak Employment (Part II): UK.